This March, Ford announced the all-new Ford Co-Pilot360: a suite of standard, advanced safety features and driver-assist technologies. In the advent of intelligent safety technology within the auto industry, Ford has once again proven itself as a top competitor. In fact, Ford Co-Pilot360 is the most advanced safety suite of all full-line North American brands, and it will come standard across Ford vehicles within the next couple of years. The new 2019 Ford Fusion marks the global debut of this state-of-the-art suite which offers drivers a wide range of protection while on the road. 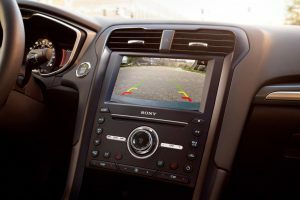 The 2019 Ford Fusion is impressive in more ways than one, but no one can deny that the Ford Co-Pilot360 is one of its most exciting standard features. Every trim level will feature this technology, which includes automatic emergency braking with pedestrian detection, lane keeping system, blind spot information system with cross-traffic alert, a rear backup camera, and auto high-beam lights. All of these features contribute to a more comfortable, confident driving experience that you can trust. For instance, the blind spot information system will actively monitor your blind spots and alert you if there are vehicles on either side of your car. The automatic emergency braking system monitors the path ahead of you and automatically applies the brake if it detects a vehicle or pedestrian, helping you to avoid front-end collisions. Stop by Tropical Ford later this year, to test drive the 2019 Ford Fusion when it arrives on our lot.